I'm very late to the party, but at least I'm coming, right? Can we go with that? The real excitement came when the grasshoppers arrived on the scene and ate up all of Pa's wheat crop. Hearing about all of the grasshoppers was revolting and awe-inspiring. (I confess that I thought, "Thank you, Lord, for pesticides.") I could not have endured. I also would have gone half mad with fright during times of family separation without a telephone handy to help keep you apprised of your loved ones' whereabouts. The Ingalls family definitely lived in a different world than our own and I can't say I envy them much for it. Sometimes I think it would be nice to be more "old fashioned" - to live off the grid and be self-sufficient. But when I hear about howling blizzards and plagues of grasshoppers I'm not so convinced that modern isn't better (for me anyway). Last summer we had a grasshopper invasion in our own neck of the woods. We'd walk outside and grasshoppers would just start flying everywhere. You tell yourself not to mind them and you do your best to ignore them but still it wasn't all that pleasant. In retrospect I've been made exceedingly and abundantly grateful for shoes. I didn't have to touch any grasshoppers with my bare skin and that is something I can appreciate. I'm grateful for families like the Ingalls who continued to do the "dirty work" in pushing the population further west and who conquered many amazing hurdles in order that we might know the land better where I live now. It's a beautiful land and I'm glad people cared enough about exploring it to come by wagon several hundred years ago. I'm also really glad that I was able to come by car and that my house has central heating. 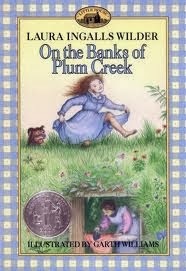 Reading On the Banks of Plum Creek was enlightening. I'm very glad that the Ingalls' struggles are not my struggles. It was a good book to read and also a good book to finish. 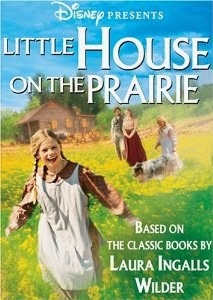 In addition to our reading, we watched the very first episode of the The Little House on the Prairie tv show. I don't think I had ever seen it. In this first episode the family is traveling from the Big Woods to the prairie and follows the most popular title fairly well. Our entire family took objection to the way that Michael Landon portrayed Pa. Bookworm1 said, "That's not what I imagined he looked like." And I said, "He's rather schizophrenic in this show." One minute the tv Pa is all calm and happy and the next he's exploding because of one thing or another. I didn't like that portrayal of Pa as I feel like it's very different than the Pa that Laura wrote of. Aside from Pa though, we all enjoyed the show (if you ignore the fact that he is the show, it is possible to enjoy it). At the conclusion of the movie version, Bookworm1 asked me concerning future episodes, "Are we going to Plum Creek next?" The way the question was worded totally made my heart smile, despite the fact that he was not enjoying the book very much. He's pointing out a truth he cannot articulate just yet: stories take you places, which is why we love them so. Ha! This review makes me smile. We went to DeSmet, SD about 10 years ago, and there they gave a dugout about the size of (one of?) the ones the Ingalls lived in. Talk about tiny! That alone would've driven me mad. 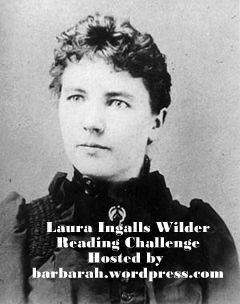 There is a lot I admire the Ingalls for that I don't think I could have done. I thought the birthday party and the leeches was exciting, though in reality that wasn't the right thing for Laura to do. It has been a long time since I've seen the first episodes of the TV show. They did stay closer to the books in the beginning. I liked Landon as Pa although that's not how I pictured him, either. I remember when the series was on thinking I could enjoy it in its own right if I didn't compare it too much to the books.